The purpose of this review is to highlight the orthodontics and periodontics interface in clinical practice for optimized treatment outcomes. Orthodontic treatment aims at providing an acceptable functional and esthetic occlusion. Tooth movements are strongly related to interactions of teeth with their supportive periodontal tissues. In recent years, due to the increased number of adult patients seeking orthodontic treatment, orthodontists frequently face patients with periodontal problems. Esthetic considerations, like uneven gingival margins or functional problems resulting from inflammatory periodontal diseases, should be considered in orthodontic treatment planning. Potentials and limitations that derive from the interdisciplinary approach of complex orthodontic-periodontal clinical problems are discussed along with the role of light forces and self-ligating brackets. Orthodontic treatment ensures proper alignment of the teeth and improves the occlusal and jaw relationship, which aids in better mastication, speech, facial esthetics, which contributes to general and oral health, thereby improving the quality - of-life. Orthodontic treatment, in addition to its benefits, has also associated risks and complications. Periodontal health is an important factor that may be used to evaluate the success of orthodontic therapy. Periodontal complications are reported to be one of the most common side-effects linked to orthodontics. Aligned teeth are easier to clean, and perhaps correct occlusion may promote healthier periodontium. It is equally important to recognize that a number of orthodontic procedures, such as the judicial use of dental extractions, interproximal enamel reduction, correct root torque, selective grinding and if indicated treatment in the mixed dentition can act to retain the roots within the alveolar bone and thereby reduce root prominence and the risk of gingival recession. They may also allow creeping attachment and if planned, a better future surgical site. The reported benefits of orthodontic treatment in relation to gingival recession are as follows: Self-maintaining oral hygiene, crown alignment within the dento-alveolar envelope, removal of occlusal trauma, root alignment within the bone, A hopeless tooth is not a useless tooth-the value of a periodontal opinion is important, as such teeth can be utilized to enhance bone and/or soft tissue anatomy before insertion of implants. The development of gingival recession during or after orthodontic treatment would be a significant clinical problem. A number of predisposing and precipitating factors include anatomical and morphological characteristics, such as alveolar bone dehiscence, gingival biotype, skeletal pattern, narrow symphysis and ectopic tooth eruption or morphology. Precipitating factors lead to an acceleration of the defect, such as traumatic tooth brushing, traumatic overbite, age, smoking, parafunctional habits, pregnancy and piercing. In addition and perhaps equally important are inappropriate treatment mechanics, such as arch expansion, with excessive proclination and the use of RME in adult patients. Care should also be taken when decompensating a class III incisor relationship in preparation for surgery and aligning ectopic/transposed teeth. One could consider the acronym ABEF to help take into account the risk factors: A: Anatomy of the alveolar bone and proximity of the root to the cortical plates B: Biotype E: Environment (oral hygiene, habits, poor brushing, poor orthodontic mechanics, active lingual retainers) F: Functional matrix. In patients requiring pre-surgical decompensation, preprosthetic preparation or where a non-extraction approach is judged as necessary: The importance of ensuring optimal oral hygiene and using a free gingival graft prior to the planned OTM should be considered. The preferred approach in these susceptible patients should be to again ensure optimal oral hygiene, align the roots within the alveolar envelope, avoiding proclination and to re-evaluate the need for a mucogingival graft after treatment. A recent clinical study on orthodontically treated patients with intact periodontium concluded that extrusion of mandibular incisors resulted in displacement of the gingival margin and the mucogingival junction by 80% and 52.5%, respectively, of the total amount of extrusion. Thus, in cases where movement of bone margin and attachment along with the tooth is not desirable (as in crown-root fractures), there is a need for periodical circumferential supracrestal fiberotomy at the start and every 2 weeks during orthodontic extrusion. According to experimental studies and clinical reports, orthodontic extrusion of teeth with one or two wall-infrabony defects results in a more favorable position of the connective tissue attachment and reduction in the defect. , Orthodontic extrusion of non-restorable teeth prior to implant placement appears to be a viable alternative for conventional bone augmentation procedures in implant recipient sites. During orthodontic intrusion of lower incisors in patients with an intact periodontium, the gingival margin and the mucogingival junction moves apically 79% and 62% of total intrusion, respectively. Regarding periodontally affected teeth, sufficient clinical data suggest that the intrusion of teeth can considerably improve the level of attachment when there is absolute control of inflammation and bacterial biofilms. , The use of light forces is recommended to move teeth efficiently and probably reduce the amount of root resorption. This is of capital importance in teeth with a reduced periodontium as the specific implication results in further loss of periodontal support and increase in crown-root ratio. Orthodontic uprighting of mesially tipped molars is accompanied by the elimination of osseous defects, improvement in pocket probing depth and in crown-root ratio. However, in molars with furcation involvement, there is an increased risk of aggravation of the periodontal problem during the orthodontic uprighting procedure. , Orthodontic movement of teeth in edentulous areas with reduced alveolar ridge height is, usually, possible with minimal loss of alveolar bone. The movement should be parallel and performed with low orthodontic forces. These movements represent the most viable method to resolve crowding and are frequently considered to produce gingival recession especially in the region of lower incisors. The most important predisposing factor for the development of gingival recession during or following orthodontic treatment is the reduced thickness of soft tissue and bone in the region. 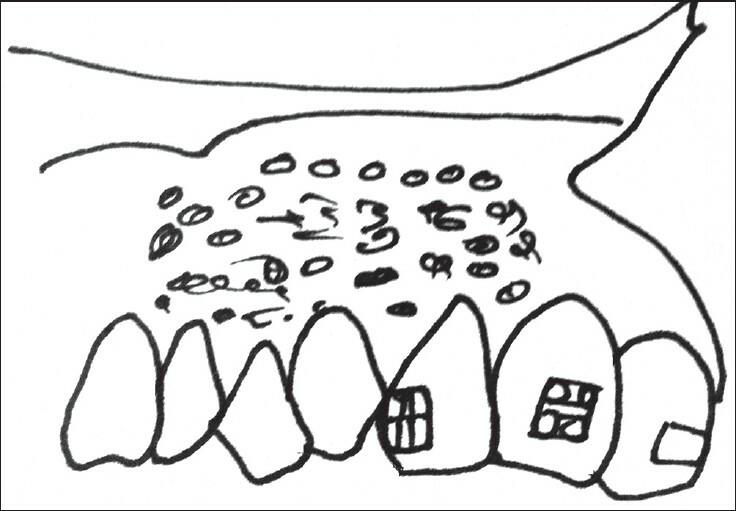 No correlation was found between the orthodontic labial inclination of mandibular central incisors and age with gingival recession (except in excessive proclination >10 mm of mandibular incisors). Sometimes a gummy smile may be attributed to extrusion of maxillary anterior teeth. It frequently happens in Angle class II, division 2 malocclusions. The indicated treatment, usually, includes orthodontic intrusion of maxillary incisors, which is expected to eliminate the gummy smile. According to Sarver and Ackerman  gummy smile caused by decreased philtrum height of the upper lip may be effectively corrected by V-Y cheiloplasty, practically covering the gummy smile with the upper lip. Polo  recommends the use of Botox for the neuromuscular correction of excessive gingival display on smiling achieving satisfactory, but transitory results. Remodeling of supra-alveolar fibers continues to take place even after a period of 4-6 months. It seems that after the end of orthodontic treatment, the retention period should exceed 12 months to provide appropriate time for remodeling of the periodontal fibers. Relapse can be prevented by orthodontic overcorrection, adjunctive periodontal surgery  and long-term fixed retention. When planning orthodontic treatment in adults with a history of periodontal disease, it is suggested to allow 2-6 months from the end of periodontal therapy until bracket placement, for periodontal tissue remodeling, restoration of health and evaluation of patient's compliance. The patient should fully understand the potential risks in case of noncompliance. It should be kept in mind that the critical pocket depth for maintaining periodontal health with ordinary oral hygiene is 5-6 mm. 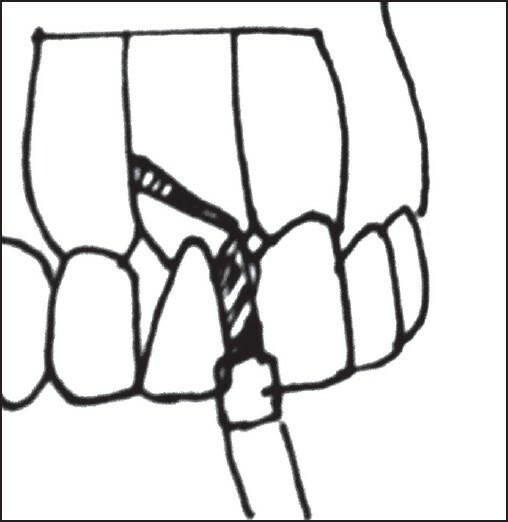 If the presence of dehiscence or fenestration is suspected; two potential options exist: Avoid over-expansion of the arch, that is, attempt to maintain the teeth within the dentoalveolar envelope by considering dental extractions or interproximal enamel reduction. In situations where we absolutely need to expand orthodontically out of the envelope, it would be wise to ask for soft tissue augmentation prior to treatment. Regenerative periodontal techniques (periodontal therapy with guided tissue regeneration or enamel matrix derivatives [EMDs]) are usually implemented before orthodontic treatment (10 days-4 months) to create favorable preorthodontic conditions in complex clinical scenarios. In case of thin periodontal tissues, the width of soft periodontal tissues must be enhanced prior to labial OTM, when it is estimated that otherwise the planned movement will result in the development of bone dehiscence. During orthodontic treatment, professional cleaning and examination of periodontal tissues should be performed routinely. If the patient fails to maintain a high level of oral hygiene, orthodontic treatment should be interrupted. Elective periodontal treatment should be implemented during the final stages of orthodontic treatment or even later, when the final position of hard and soft tissues can be safely determined. After the end of active orthodontic treatment and appliance removal, the patient should receive renewed oral hygiene instructions for reducing the risk of recession because plaque removal and tooth cleaning will be more easily performed. The importance of re-educating the patient in respect of their brushing technique in conjunction to considering adjunct interdental cleaning aids, such as an oral irrigator, dental floss and interdental toothbrushes. In terms of what is the best method(s) for recession coverage, there is a need to distinguish between single and multiple recessions. In respect of single gingival recession, a number of options exist for recession coverage, an EMD (Emdogain) with or without a connective tissue graft in conjunction with a coronally positioned flap. , Good long-term (5 years) outcomes have been reported with connective tissue grafts and a coronally advanced flap. Alternative methods include the envelope technique with connective tissue graft  or the laterally positioned flap with or without connective tissue graft. In the case of multiple recessions, the modified coronal advancement flap with or without graft is preferred in the maxilla,  whilst in the mandible, its use in conjunction to a connective tissue graft should be considered. In regard to the Miller's class III defect, the modified coronal advancement tunnel technique with connective tissue graft should be considered. Whilst a free gingival graft can be used in both single and multiple gingival recessions, it is associated with high morbidity due to graft removal from the palate and sometimes necrosis of the graft. Orthodontic tooth movement is a process of paradental remodeling mediated by inflammatory mediators like PGE2s, cytokines, neuropeptides, MMPs, etc. These inflammatory mediators are also present in periodontitis and periodontal diseases. Hence the detection of these inflammatory mediators is of paramount importance in detection and screening of periodontal diseases as well as demonstrating OTM. GCF markers have several shortcomings like long collection times, easily prone to contamination, thick viscosity, questionable accuracy, etc. Salivary biomarkers are rapidly gaining increasing popularity over GCF markers these days. Ease of collection, storing and shipping. Easier handling as it does not clot. Informative analytes generally present in lower amounts than in serum. An increase in salivary levels of Cathepsin G, Elastase, Elastase inhibitors and C-reactive proteins correlated with increased periodontal breakdown. Salivary biomarkers Interleukin-1β and MMP-8 specific for three aspects of periodontitis that is inflammation, collagen degradation and bone turnover were significantly higher in subjects with periodontal breakdown. The activity of creatine kinase, Lactate dehydrogenase, Aspartate aminotransferase, Alanine aminotransferase, Gamma glutamil transferase, acid phosphatase and alkaline phosphatase significantly increased in the saliva of patients with periodontal breakdown. Elevated mean salivary levels of TNF-α in subjects having periodontal diseases. The mean myeloperoxidase activity in both GCF and saliva increased 2 h after orthodontic appliance activation. The salivary concentrations of deoxypyridinoline (DPD) and bone-specific alkaline phosphatase (BAP) as detected with four consecutive visits may be linked with different phases of tooth movement. Results showed that although DPD values revealed an increasing nature after force application and BAP values showed a decreasing trend, only the former showed significant changes over time which implied that DPD dominates the earlier phases of tooth movement while BAP serves as an indicator of bone formation as soon as tooth movement stops. Thus, qualitative changes in the composition of saliva biomarkers used in estimating OTM mediated by paradental remodeling could have significance in diagnosis and treatment of periodontal disease as well. Harmonious cooperation between the periodontist and the orthodontist offers great possibilities for the treatment of combined orthodontic-periodontal problems. Orthodontic treatment along with patient's compliance and absence of periodontal inflammation can provide satisfactory results without causing irreversible damage to periodontal tissues. Orthodontic treatment can expand the possibilities of periodontal therapy in certain patients, contributing to better control of microbiota, reducing the potentially hazardous forces applied to teeth and finally improved the overall prognosis. Participation of the periodontist is also essential, either in management of orthodontic-periodontal problems or in specific interventions aiming to prevent orthodontic treatment's relapse. Dannan A. An update on periodontic-orthodontic interrelationships. J Indian Soc Periodontol 2010;14:66-71. Talic NF. Adverse effects of orthodontic treatment: A clinical perspective. Saudi Dent J 2011;23:55-9. Brägger U, Lang NP. The significance of bone in periodontal disease. Semin Orthod 1996;2:31-8. Romero M, Albi M, Bravo LA. Surgical solutions to periodontal complications of orthodontic therapy. J Clin Pediatr Dent 2000;24:159-63. Genco RJ, Borgnakke WS. Risk factors for periodontal disease. Periodontol 2000 2013;62:59-94. Meeran NA. Iatrogenic possibilities of orthodontic treatment and modalities of prevention. J Orthod Sci 2013;2:73-86. Petti S, Barbato E, Simonetti D'Arca A. Effect of orthodontic therapy with fixed and removable appliances on oral microbiota: A six-month longitudinal study. New Microbiol 1997;20:55-62. Paolantonio M, Festa F, di Placido G, D'Attilio M, Catamo G, Piccolomini R. Site-specific subgingival colonization by Actinobacillus actinomycetemcomitans in orthodontic patients. Am J Orthod Dentofacial Orthop 1999;115:423-8. Türkkahraman H, Sayin MO, Bozkurt FY, Yetkin Z, Kaya S, Onal S. Archwire ligation techniques, microbial colonization, and periodontal status in orthodontically treated patients. Angle Orthod 2005;75:231-6.
van Gastel J, Quirynen M, Teughels W, Coucke W, Carels C. Longitudinal changes in microbiology and clinical periodontal variables after placement of fixed orthodontic appliances. J Periodontol 2008;79:2078-86. Lee SM, Yoo SY, Kim HS, Kim KW, Yoon YJ, Lim SH, et al. Prevalence of putative periodontopathogens in subgingival dental plaques from gingivitis lesions in Korean orthodontic patients. J Microbiol 2005;43:260-5. Ari-Demirkaya A, Ilhan I. Effects of relapse forces on periodontal status of mandibular incisors following orthognathic surgery. J Periodontol 2008;79:2069-77. Lundström F, Hamp SE, Nyman S. Systematic plaque control in children undergoing long-term orthodontic treatment. Eur J Orthod 1980;2:27-39. Speer C, Pelz K, Hopfenmüller W, Holtgrave EA. Investigations on the influencing of the subgingival microflora in chronic periodontitis. A study in adult patients during fixed appliance therapy. J Orofac Orthop 2004;65:34-47. Artun J, Urbye KS. The effect of orthodontic treatment on periodontal bone support in patients with advanced loss of marginal periodontium. Am J Orthod Dentofacial Orthop 1988;93:143-8. Re S, Corrente G, Abundo R, Cardaropoli D. Orthodontic treatment in periodontally compromised patients: 12-year report. Int J Periodontics Restorative Dent 2000;20:31-9. Wennström JL, Stokland BL, Nyman S, Thilander B. Periodontal tissue response to orthodontic movement of teeth with infrabony pockets. Am J Orthod Dentofacial Orthop 1993;103:313-9. Boyd RL, Baumrind S. Periodontal considerations in the use of bonds or bands on molars in adolescents and adults. Angle Orthod 1992;62:117-26. Melsen B. 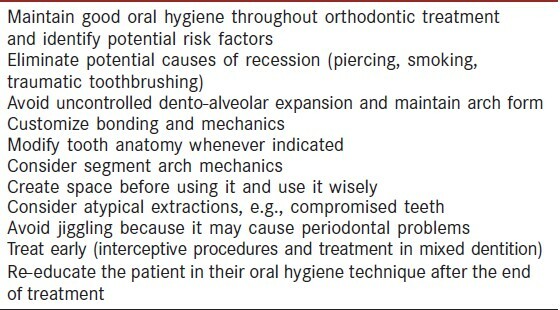 Limitations in adult orthodontics. In: Melsen B, editor. Current Controversies in Orthodontics. Chicago: Quintessence; 1991. p. 147-80. Alves de Souza R, Borges de Araújo Magnani MB, Nouer DF, Oliveira da Silva C, Klein MI, Sallum EA, et al. Periodontal and microbiologic evaluation of 2 methods of archwire ligation: Ligature wires and elastomeric rings. Am J Orthod Dentofacial Orthop 2008;134:506-12. Corrente G, Abundo R, Re S, Cardaropoli D, Cardaropoli G. Orthodontic movement into infrabony defects in patients with advanced periodontal disease: a clinical and radiological study. J Periodontol 2003;74:1104-9. Melsen B, Allais D. Factors of importance for the development of dehiscences during labial movement of mandibular incisors: a retrospective study of adult orthodontic patients. Am J Orthod Dentofacial Orthop 2005;127:552-61. Pikdoken L, Erkan M, Usumez S. Gingival response to mandibular incisor extrusion. Am J Orthod Dentofacial Orthop 2009;135:432.e1-6. Kozlovsky A, Tal H, Lieberman M. Forced eruption combined with gingival fiberotomy. 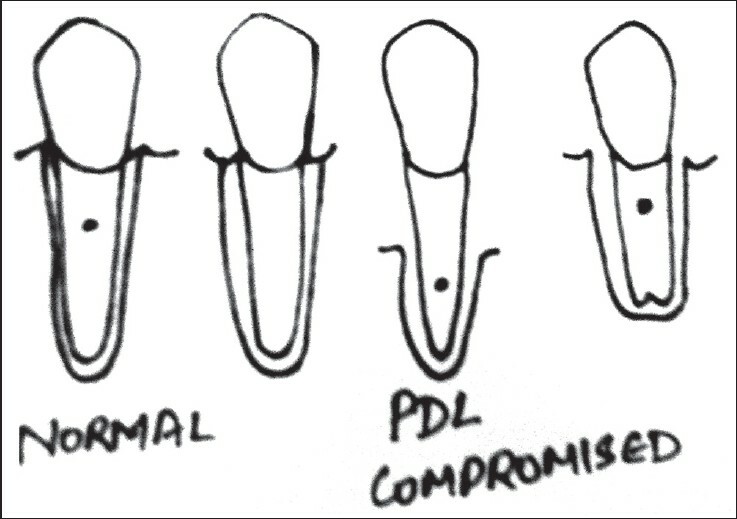 A technique for clinical crown lengthening. J Clin Periodontol 1988;15:534-8.
van Venrooy JR, Yukna RA. Orthodontic extrusion of single-rooted teeth affected with advanced periodontal disease. Am J Orthod 1985;87:67-74. Iino S, Taira K, Machigashira M, Miyawaki S. Isolated vertical infrabony defects treated by orthodontic tooth extrusion. Angle Orthod 2008;78:728-36. Erkan M, Pikdoken L, Usumez S. Gingival response to mandibular incisor intrusion. Am J Orthod Dentofacial Orthop 2007;132:143.e9-13. Melsen B, Agerbaek N, Markenstam G. Intrusion of incisors in adult patients with marginal bone loss. Am J Orthod Dentofacial Orthop 1989;96:232-41. Cardaropoli D, Re S, Corrente G, Abundo R. Intrusion of migrated incisors with infrabony defects in adult periodontal patients. Am J Orthod Dentofacial Orthop 2001;120:671-5. Re S, Cardaropoli D, Abundo R, Corrente G. Reduction of gingival recession following orthodontic intrusion in periodontally compromised patients. Orthod Craniofac Res 2004;7:35-9. Brown IS. The effect of orthodontic therapy on certain types of periodontal defects. I. Clinical findings. 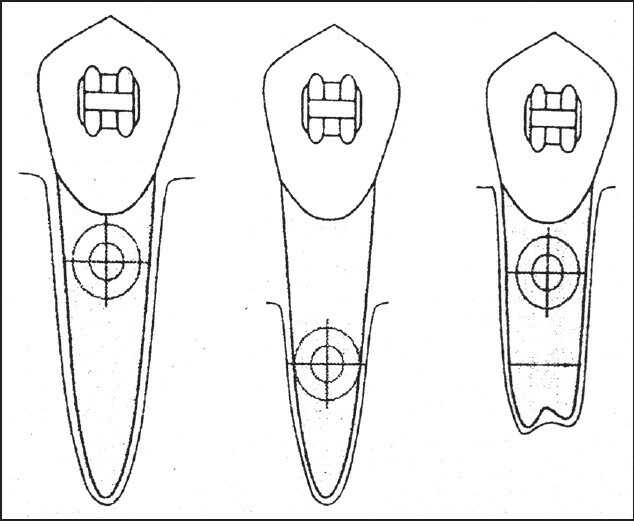 J Periodontol 1973;44:742-56. Burch JG, Bagci B, Sabulski D, Landrum C. Periodontal changes in furcations resulting from orthodontic uprighting of mandibular molars. Quintessence Int 1992;23:509-13. Müller HP, Eger T, Lange DE. Management of furcation-involved teeth. A retrospective analysis. J Clin Periodontol 1995;22:911-7. Hom BM, Turley PK. The effects of space closure of the mandibular first molar area in adults. Am J Orthod 1984;85:457-69. Djeu G, Hayes C, Zawaideh S. Correlation between mandibular central incisor proclination and gingival recession during fixed appliance therapy. Angle Orthod 2002;72:238-45. Wennström JL. Mucogingival considerations in orthodontic treatment. Semin Orthod 1996;2:46-54. Kokich VG. Esthetics: The orthodontic-periodontic restorative connection. Semin Orthod 1996;2:21-30. Vig RG, Brundo GC. The kinetics of anterior tooth display. J Prosthet Dent 1978;39:502-4. Sarver DM, Weissman SM. Long-term soft tissue response to LeFort I maxillary superior repositioning. Angle Orthod 1991;61:267-76. Sarver DM, Ackerman MB. Dynamic smile visualization and quantification: part 1. Evolution of the concept and dynamic records for smile capture. Am J Orthod Dentofacial Orthop 2003;124:4-12. Polo M. Botulinum toxin type A (Botox) for the neuromuscular correction of excessive gingival display on smiling (gummy smile). Am J Orthod Dentofacial Orthop 2008;133:195-203. Reitan K. Principles of retention and avoidance of posttreatment relapse. Am J Orthod 1969;55:776-90. Destang DL, Kerr WJ. Maxillary retention: Is longer better? Eur J Orthod 2003;25:65-9. Edwards JG. The prevention of relapse in extraction cases. Am J Orthod 1971;60:128-44. Edwards JG. A long-term prospective evaluation of the circumferential supracrestal fiberotomy in alleviating orthodontic relapse. Am J Orthod Dentofacial Orthop 1988;93:380-7. Katsaros C, Livas C, Renkema AM. Unexpected complications of bonded mandibular lingual retainers. Am J Orthod Dentofacial Orthop 2007;132:838-41. Pazera P, Fudalej P, Katsaros C. Severe complication of a bonded mandibular lingual retainer. Am J Orthod Dentofacial Orthop 2012;142:406-9. Sanders NL. Evidence-based care in orthodontics and periodontics: A review of the literature. J Am Dent Assoc 1999;130:521-7. Socransky SS, Haffajee AD. The nature of periodontal diseases. Ann Periodontol 1997;2:3-10. Holmes HD, Tennant M, Goonewardene MS. Augmentation of faciolingual gingival dimensions with free connective tissue grafts before labial orthodontic tooth movement: An experimental study with a canine model. Am J Orthod Dentofacial Orthop 2005;127:562-72. Chambrone L, Sukekava F, Araújo MG, Pustiglioni FE, Chambrone LA, Lima LA. Root-coverage procedures for the treatment of localized recession-type defects: A Cochrane systematic review. J Periodontol 2010;81:452-78. Johal A, Katsaros C, Kiliaridis S, Leitao P, Rosa M, Sculean A, et al. State of the science on controversial topics: Orthodontic therapy and gingival recession (a report of the Angle Society of Europe 2013 meeting). Prog Orthod 2013;14:16. Pini-Prato GP, Cairo F, Nieri M, Franceschi D, Rotundo R, Cortellini P. Coronally advanced flap versus connective tissue graft in the treatment of multiple gingival recessions: A split-mouth study with a 5-year follow-up. J Clin Periodontol 2010;37:644-50. Raetzke PB. Covering localized areas of root exposure employing the "envelope" technique. 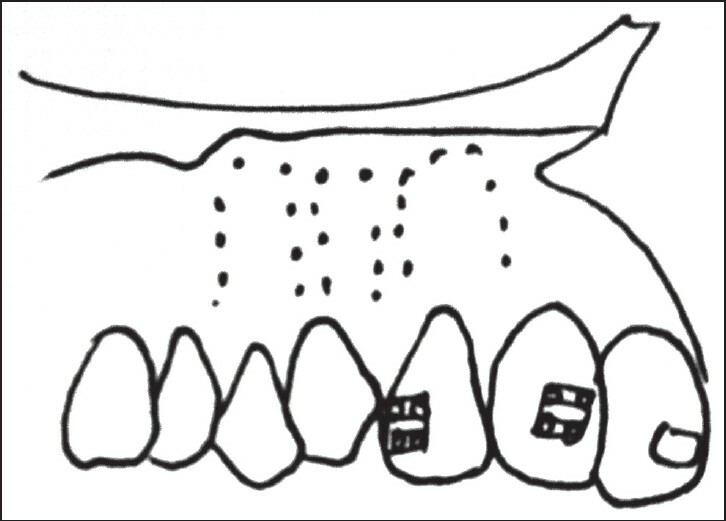 J Periodontol 1985;56:397-402. Zucchelli G, De Sanctis M. Long-term outcome following treatment of multiple Miller class I and II recession defects in esthetic areas of the mouth. J Periodontol 2005;76:2286-92.
de Sanctis M, Baldini N, Goracci C, Zucchelli G. Coronally advanced flap associated with a connective tissue graft for the treatment of multiple recession defects in mandibular posterior teeth. Int J Periodontics Restorative Dent 2011;31:623-30. Pederson ED, Stanke SR, Whitener SJ, Sebastiani PT, Lamberts BL, Turner DW. Salivary levels of alpha 2-macroglobulin, alpha 1-antitrypsin, C-reactive protein, cathepsin G and elastase in humans with or without destructive periodontal disease. Arch Oral Biol 1995;40:1151-5. Miller CS, King CP Jr, Langub MC, Kryscio RJ, Thomas MV. Salivary biomarkers of existing periodontal disease: A cross-sectional study. J Am Dent Assoc 2006;137:322-9. Todorovic T, Dozic I, Vicente-Barrero M, Ljuskovic B, Pejovic J, Marjanovic M, et al. Salivary enzymes and periodontal disease. Med Oral Patol Oral Cir Bucal 2006;11:E115-9. Frodge BD, Ebersole JL, Kryscio RJ, Thomas MV, Miller CS. Bone remodeling biomarkers of periodontal disease in saliva. J Periodontol 2008;79:1913-9. Marcaccini AM, Amato PA, Leão FV, Gerlach RF, Ferreira JT. Myeloperoxidase activity is increased in gingival crevicular fluid and whole saliva after fixed orthodontic appliance activation. Am J Orthod Dentofacial Orthop 2010;138:613-6. Flórez-Moreno GA, Marín-Restrepo LM, Isaza-Guzmán DM, Tobón-Arroyave SI. Screening for salivary levels of deoxypyridinoline and bone-specific alkaline phosphatase during orthodontic tooth movement: A pilot study. Eur J Orthod 2013;35:361-8. Wilcko WM, Wilcko MT, Bouquot JE, Ferguson DJ. Accelerated orthodontics with alveolar reshaping. J Orthod Pract 2000;10:63-70. Nazarow AD, Ferguson DJ, Wilkcko WM, Wilcko MT. Improved orthodontics retention following corticotomy using ABO oblective grading system. J Dent Res 2004;83:Abs 2644. Murphy NC. In vivo tissue engineering for orthodontists: A modest first step. In: Davidovitch Z, Mah J, Suthanarak S, editors. Biological Mechanisms for Tooth Eruption, Resorption and Movement. Boston: Harvard Society for the Advancement of Orthodontics; 2006. p. 385-410. Frost HM. Perspectives: A proposed general model of the "mechanostat" (suggestions from a new skeletal-biologic paradigm). Anat Rec 1996;244:139-47. Frost HM. The Utah paradigm of skeletal physiology: An overview of its insights for bone, cartilage and collagenous tissue organs. J Bone Miner Metab 2000;18:305-16. About the Authors Dr. Gurkeerat Singh, is a graduate and postgraduate from the Mangalore College of Dental Surgery, a constituent of the Manipal Academy of Higher Education, Manipal. He did his M. Orth in 2001 and is registered with the Royal College of Surgeons, London as well as the Royal College of Physicians and Surgeons of Glasgow. He is a diplomate of the Indian Board of Orthodontics. Dr. Singh has over two dozen publications in various Indian and foreign journals to his credit as well as " The Textbook of Orthodontics", the first full-color textbook by an Indian author on the subject and a " Mini Atlas on Orthodontics". He is professor and head of the department of orthodontics and dentofacial orthopedics at Sudha Rustagi College of Dental Sciences and Research, Faridabad, Haryana. He is also the Editor of the Journal of the Indian Orthodontic Society. Dr. Puneet Batra completed his BDS 1996 and did his MDS in Orthodontics from All India Institute of Medical Sciences New Delhi. He did his M. Orth from the Royal College of Surgeons in Edinburgh in the year 2003 and FFD Orth from the Royal College of Surgeons in Ireland in 2005. He was awarded DNB in Orthodontics from the ministry of health and family welfare. He has been awarded the prestigious commonwealth scholarship (Great Ormond Street London) and TC White award (Dunddee Dental School Scotland). He has been awarded the PP Jacob award and the JG Kannapan award by the Indian Orthodontic Society. He has more than 70 publications in peer reviewed national and international journals. He is the Vice Principal and Professor and Head in Orthodontics and PG guide at Institute of Dental Studies and Technologies Modinagar. 1 Challenges in Ortho - Perio Interaction – A Systemic Update.